In 2018, skill labor jobs continue to grow and present opportunities to workers across the country. Despite this sustained growth, the Associated General Contractors (AGC) says that 70% of companies nationwide still can’t find enough boots to keep their job sites running and delivering on schedule. According to the Bureau of Labor Statistics, Construction and other middle-skill jobs are expected to account for nearly a third of all new job through 2022; many of which pay an average of $55,000 per year without the need of a four-year degree. In NYC, 6800 new construction jobs were created in April 2018 alone, but like many other parts of the country, finding that new generation of workers will require pushing back against the stigma associated with working in the trades. For decades there’s been a near-universal push by schools, administrators, and parents for university education as a one-size fits all path to success. Often ignoring the strengths of young men and women and at once kneecapping the labor market. At the same time, the trades have suffered from both a talent drain and unfair portrayals of the trades in the mainstream. 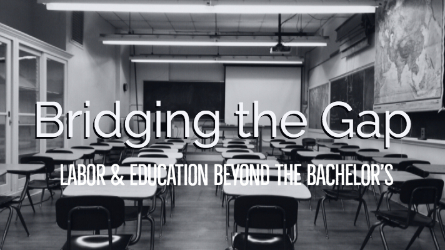 Schools and administrators have long used the number of graduates enrolling in four-year college/universities as a metric for gauging their success and impact. Parents have also bought into the idea that blue-collar work is limiting or just “not good enough” to provide a decent, middle-class life for their children; pushing their kids toward college instead of apprenticeships or technical training. To turn the tide, many states are proactively seeking to change perceptions of skilled-labor. A recent report from the Washington State Auditor confirmed that many mid-level-skills jobs sit unfilled as schools push students to pursue a bachelor’s degree. The report found that many times, students that seek a four-year degree program do not complete the program (1 in 5 in private institutions according to the audit) and are more likely to incur debt while students enrolled in college-level career and technical education (CTE) courses were more aligned with the needs of employers in high-wage jobs. Students that participated in CTE courses while in high school were able to complete their academic careers in 2 years or less and start working in professions that averaged $55,000/year; many only requiring a high school diploma. Getting the word out isn’t as easy as merely publishing a report. The WA auditor has noted that while the differences in opportunities are apparent, money alone isn’t going to turn the tide. Among the proposed recommendations, the WA auditor stresses that early career guidance – including highlighting options that require less than four years of college – begin at about the 7th Grade. The rest of the country is also striving to make changes of their own; California is spending $200 million to improve the delivery of technical education, Iowa community colleges are partnering with local businesses to create new apprenticeship programs, and Tennessee has made its technical colleges free. For other institutions, changing parents’ biases about the trades and tradespeople are high on the list. Of the $200 million that California is spending on promoting CTE, $6 million is being allotted for the renaming of schools like Lake Washington Technical College’s name change to The Lake Washington Institute of Technology. It’s a clear sign that there’s lots of work that still needs to be done. Thankfully partnerships with employers and schools, like a recent Signing Day hosted by Henrico County Public Schools in Virginia, or here in NYC, the DOB’s Junior Architects and Engineers Day can help change people’s perceptions by exposing them to the many career paths a foundation in skilled labor can afford them. With time, these programs will help the U.S. close the skilled-labor gap.